Welcome to a great sketch challenge this week with the Paper Craft Crew Design Team! So cute, right?! I love the A Little Foxy Designer Series Paper Stack that coordinates with this suite; the images are so fun! I started with a card base of Smoky Slate, then added a panel of Pool Party. I topped that with a piece of the A Little Foxy DSP (these are the only kind of mushrooms I like); I cut it in half on the diagonal, just like the sketch. I stamped the little fox directly onto a piece of Whisper White cardstock in Cajun Craze ink, then die cut it using the Tags & Labels framelits and my Big Shot. I then stamped just the tail onto a small scrap piece, cut it out and popped it up with Stampin’ Dimensionals over the stamped tail; you can see that it extends beyond the Tag shape. I stamped the eyes and legs for the fox in Memento Black ink, then layered my fox onto the next size tag shape from the Tags & Labels framelits, cut in Pool Party cardstock. I cut a banner shape from a strip of Calypso Coral cardstock, then embossed it using the Woodland Embossing Folder, and glued it under the fox. 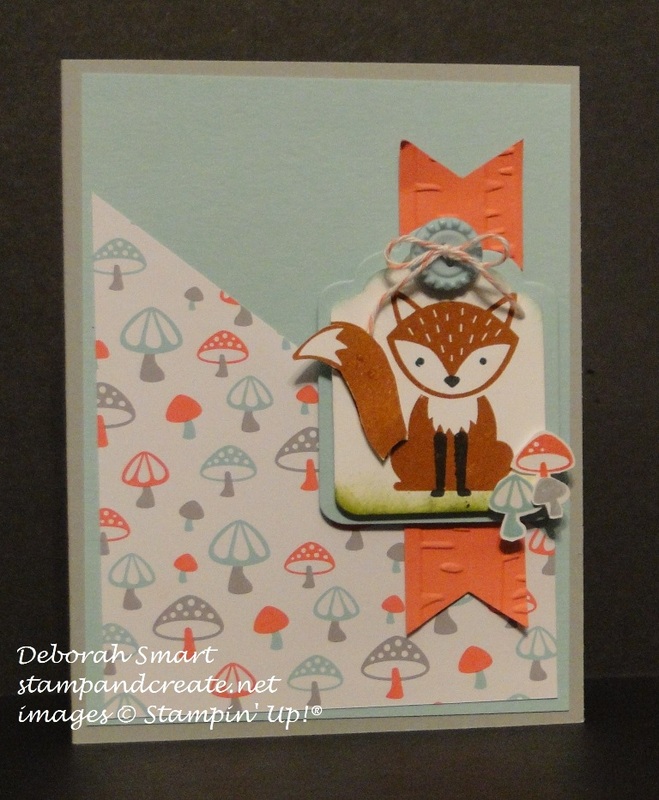 On scrap Whisper White cardstock, I stamped the 3 little mushrooms in Pool Party, Calypso Coral and Smoky Slate inks, then cut them by hand and layered them onto the bottom right corner below the fox. I used a retired Pool Party button and tied it with a bow in retired Calypso Coral Baker’s Twine, then attached it with a Glue Dot. I like that I don’t have to have a sentiment on this card, and it still looks great! I may add a sentiment to the front later, when I decide what occasion and to whom I send it. I hope you liked my card – if you have time to leave a message, I always love to read them! Next, you’ll want to head over to the Paper Craft Crew page & check out what the rest of the Design Team have to share with you – then I hope you’ll link up your own card! Next Next post: Wacky Watercooler 3rd Anniversary Blog Hop!